This clichéd comedy which seems familiar to the Julie Robert's movie "My Best Friend's Wedding" is an enjoyable movie for a night in with your partner. Starring Patrick Dempsey from Grey's Anatomy, he plays a charming yet womanizing man who unfortunately or fortunately for him, falls for his best friend (Michelle Monahan) as she becomes engaged. From here the conflict begins as he attempts to win the heart of his best friend and somehow ends up as "Maid of Honor". This movie is definitely one for the female viewer as Dempsey plays the sophisticated charmer, however the star of the film is Monahan herself who truly steals the show in the end. 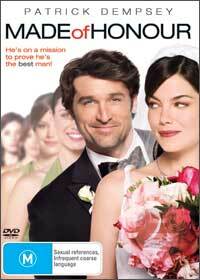 Although predictable at times, Made of Honor still contains some interesting story twists and a few good laughs that is probably the perfect Romantic movie for two.